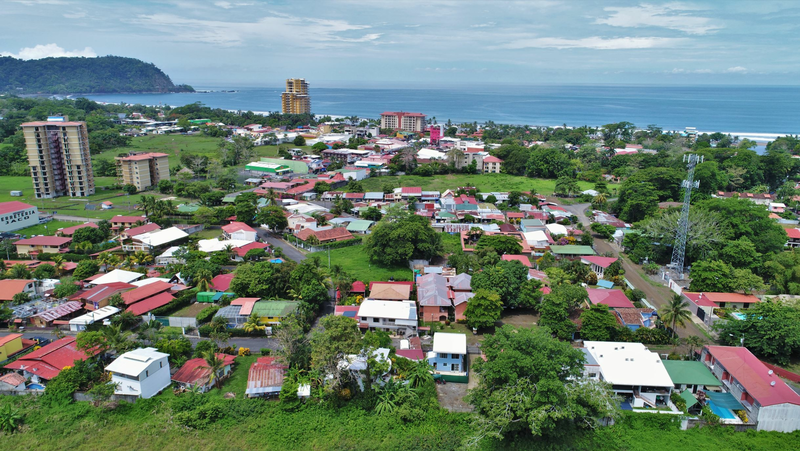 La Estancia Estancia Homesites is a gated community in Herradura Beach, Costa Rica. The community is located on the road to the beach of Herradura. La Estancia Homesites is an upscale and secure community by the beach not too far from conveniences. La Estancia offers home sites and already built houses. La Estancia is surrounded by mountains and green forest. The colonial style community has been designed and built with the best standards, minimizing the impact on nature. The project has cobble stone streets, underground utilities, 24 hour security, a club house with barbeque area, swimming pool and tennis court. All the infrastructure and amenities in La Estancia are 100% complete. All the home sites are ready to custom build your dream home on. The monthly HOA fees are around $150 and will ensure for proper upkeep, landscaping and security of the community. La Estancia offers property management services. You can choose to live or vacation in La Estancia. Across the street is a commercial plaza with a convenience store, pharmacy, bank and doctors office. The beach of Herradura is a walk or a short drive away. Here you find a couple local restaurants and a bar. The Pacific Ocean at Herradura bay is much calmer than in other places and is a perfect place to cool down on a hot sunny day. Herradura bay offers great scenery with its blue water, white sand beach, palm trees, green mountains and boats in the ocean. La Estancia is near the Los Suenos Resort where you find a world class marina with tons of sport fishing possibilities and a 18 hole golf course. You will also find a spa, casino and several fine dining options in this resort. The town next to Herradura is Jaco Beach. This bustling town offers all the amenities you are looking for.